Vigilant Guard disaster response exercise, Duluth, MN, 2015. Photo credit: Dan Williams. Disaster response training is serious business for a wide range of players. Government, military, hospitals, schools, and non-profit organizations, such as the American Red Cross, are among them. 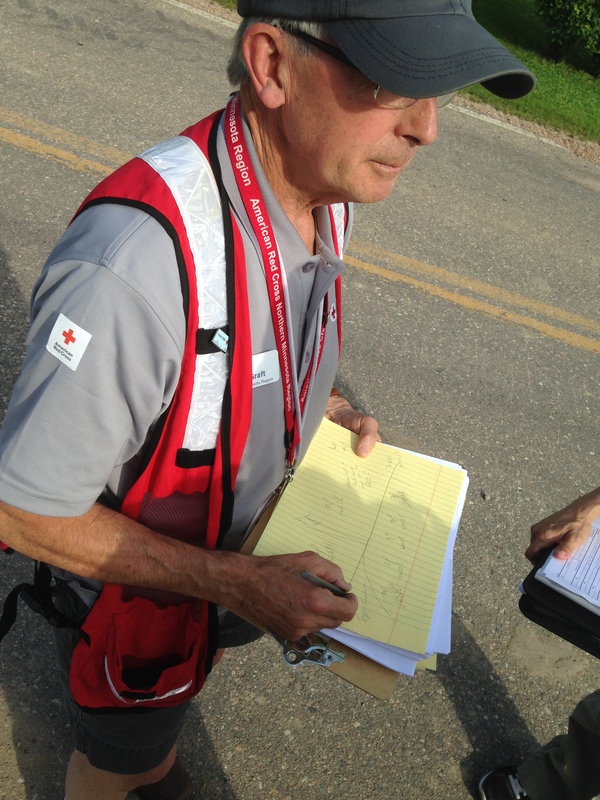 On August 24 and 25 in Duluth, Minnesota, the Red Cross and several partners got deep-in-the-weeds serious for Vigilant Guard 2015, a full-scale disaster response 4 years in the making. The mock disasters for Vigilant Guard were straight line winds causing severe damage to Hermantown, Proctor and the Duluth Hillside; a railway chemical spill; and a ship destroying the Blatnik Bridge spanning the bay between Duluth and Superior. 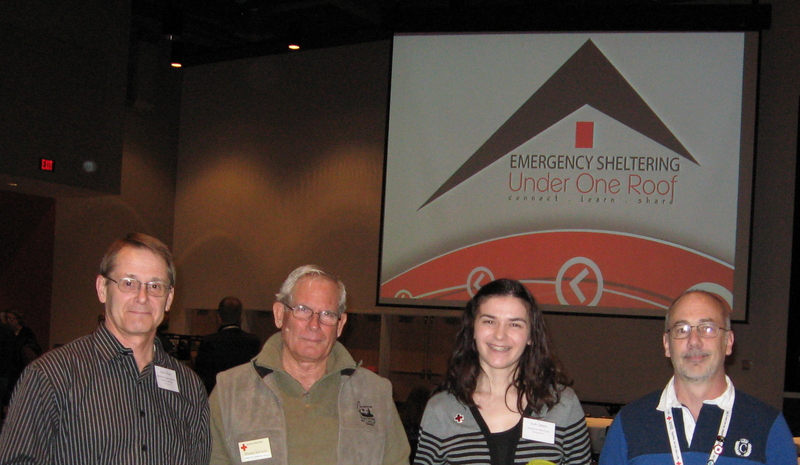 The Red Cross role in the exercise was to establish a shelter at the Duluth Entertainment and Convention Center (DECC), which is a designated Red Cross shelter location for a real, large-scale disaster response. 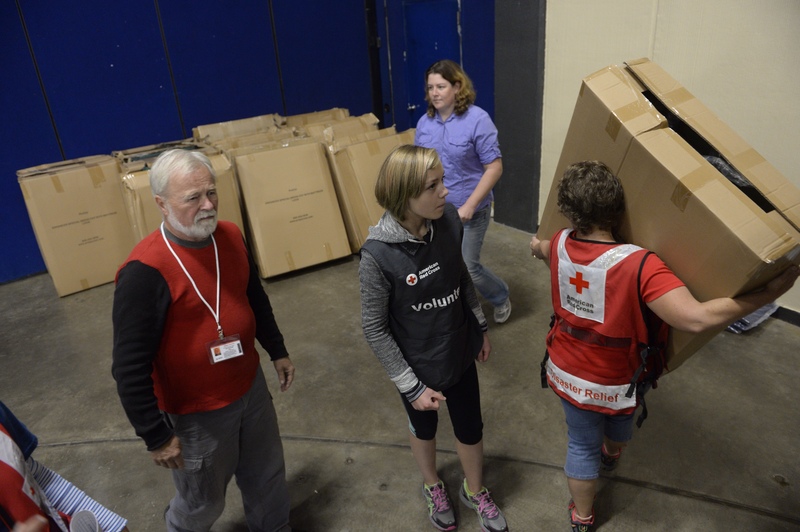 Red Cross volunteers off load supplies for a mock shelter during the Vigilant Guard at the convention center in Duluth, Minn., August 24, 2015. Photo credit: Jonathan Snyder. On Monday at the Red Cross chapter office in Duluth, 35 public health nurses from 7 Counties, one Native American tribe, the Medical Reserve Corps and the Minnesota Department of Health took training on how to provide nursing services in a disaster shelter. At the same time, more than 35 Red Cross volunteers and others from partner organizations conducted a training on how to stand-up a disaster shelter. The training ranged from setting up cots and doing registration to ensuring client safety and securing shelter resources. Red Cross volunteers from across Minnesota were represented. It will offer an opportunity for Red Cross volunteers, new and old, to test their skills when disaster strikes. “Tomorrow is the day to make mistakes. I always tell people the key word is disaster…We take care of people in the time of disaster small or big,” said Red Cross Disaster Program Manager Tony Guerra. 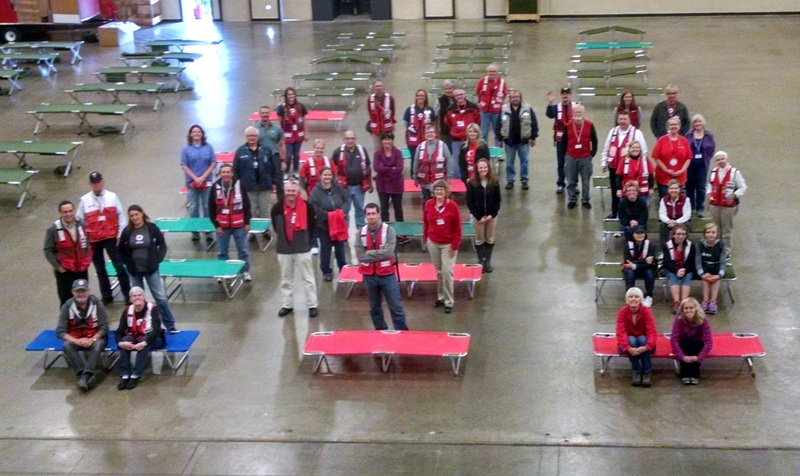 Red Cross volunteers operated a mock shelter to support the Vigilant Guard disaster response exercise, August 2015. Photo credit: Dan Williams. 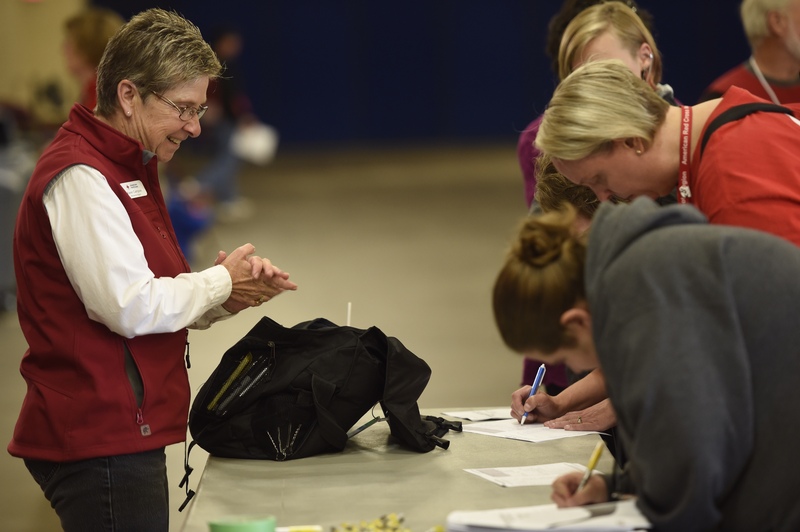 Red Cross volunteer Karen Campion oversees the sign-in process prior to setting up a mock shelter at the convention center in Duluth, Minn., during the Vigilant Guard disaster training exercise, August. 24, 2015. Photo credit: Jonathan Snyder. We’re also grateful for three new University of Wisconsin-Superior international students who came to the shelter as well and gave the volunteers a chance to use language translation materials the Red Cross uses in shelters. As a part of the military component of Vigilant Guard 2015, a group of distinguished visitors toured Camp Ripley in Little Falls and the convention center in Duluth where full-scale exercise was taking place. As part of that visit, Phil Hansen, CEO of the American Red Cross Minnesota Region, as well as Regional Board Chair Lori McDougal and Vice Chair Joan Thompson, were able to visit the mock shelter exercise in Duluth. They met many of the volunteers who set up the shelter and several of the Red Cross nurses who trained during the exercise. Phil, Lori and Joan were impressed with the commitment of the volunteers as well as the close working relationship between the Red Cross and our military partners. 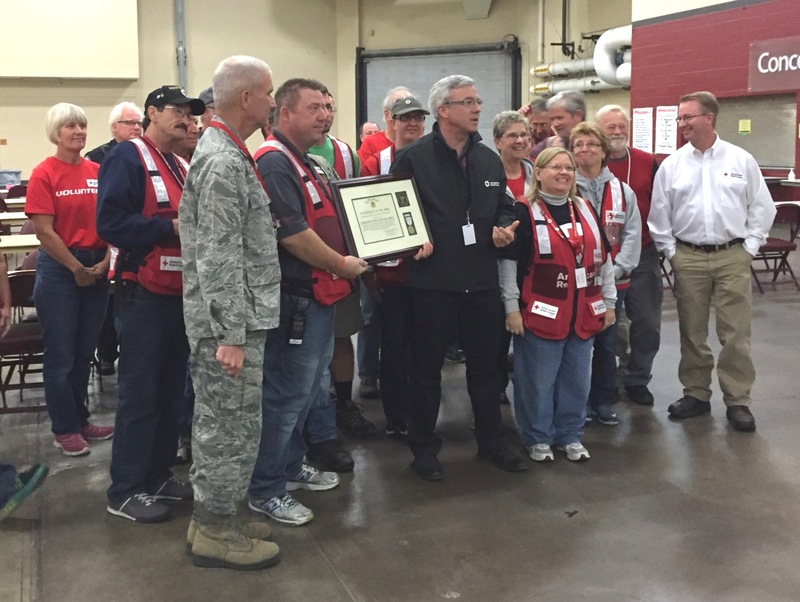 The Minnesota National Guard presented an award of service to the Red Cross following the Vigilant Guard disaster response exercise, Duluth, Minn., August 2015. Photo credit: Joan Thompson. 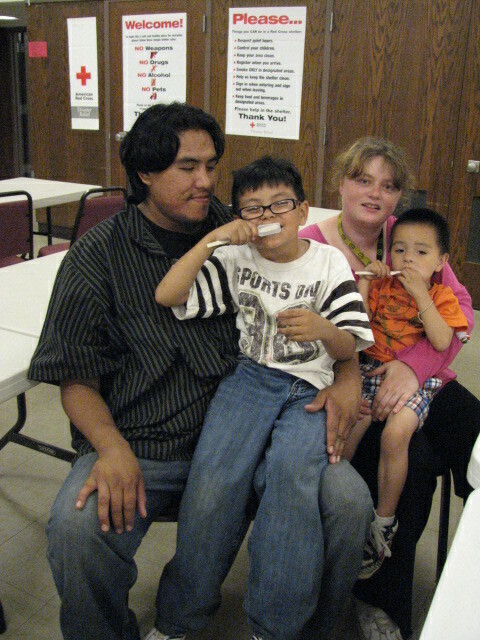 To learn more about getting involved with the Red Cross, click here. To access Red Cross disaster and safety tools and resources, click here. For everyday, handy preparedness, download a free Red Cross mobile app. During recent flooding in Minnesota, Jordan High School was approved as a shelter site in case of human or natural disaster. We want to share the story with you about how the site was selected and about some unplanned and terrific community outreach. We wanted to show that the Red Cross was there to support the community, so we took the logistics truck rather than a regular car to Jordan High School. We parked the truck outside the main doors of the school. Once there, parents and students saw the Red Cross presence while we were in the high school doing the shelter evaluation work with school officials. At the end of our visit, the principal kindly asked us if we could show her the truck contents. As we walked to the truck, Debra saw some students and parents and invited them to join us. 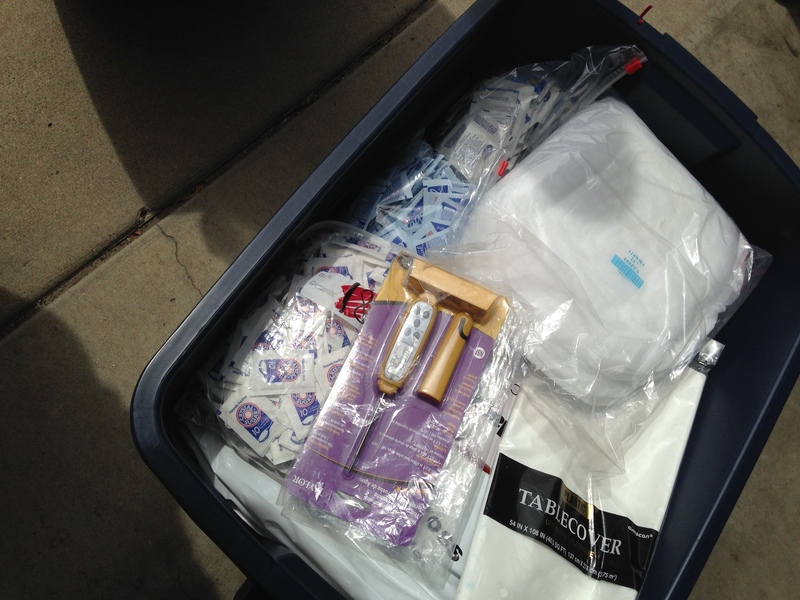 When I opened the back door of the truck, they were impressed with what and how many supplies and kits we carried. This became a teaching moment to affirm our commitment to the community and how the Red Cross handles disaster responses. One young teenage girl went from worrying about an unknown terrible thing happening in her school to a double-thumbs up because we were ready with disaster supplies. All the students and parents were pleased to help the Red Cross and they appreciated how the Red Cross would help them in return. They were grateful we wanted to help their community, and so this ended up being a public relations success. Our visit gave us the opportunity to survey the site, to build trust and a partnership, and to learn from the local community of what they were experiencing and anticipating. As we do on all of our survey calls, we spent a little time explaining the bigger picture of how we would set up a shelter and how to use it. The benefit of sharing our story is that the community started to think with us, and came up with creative solutions and additional spaces that we would never think of by just looking at a floor plan. The school district superintendent signed the agreement as we completed the opening inspection. The superintendent, principal, and custodian all brainstormed with us to find space and solutions to our anticipated needs, so we set up the expectation that they could be contacted 24/7 during an actual need for opening a shelter. At the end of the day, we came away with a shelter partner who feels comfortable working with us and can tell others an important part of the Red Cross story. And on a slightly humorous note, we did not have to do this at two in the morning during disaster response! 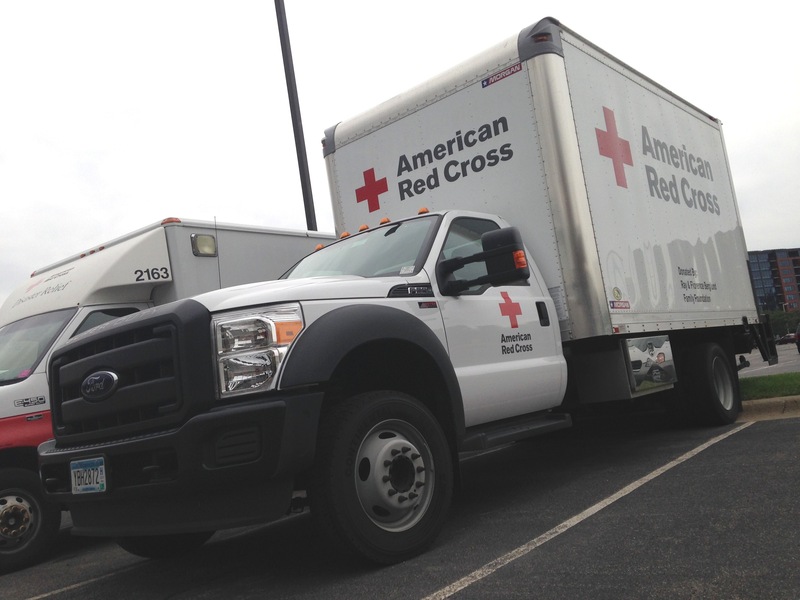 Click here to learn more about American Red Cross disaster relief. 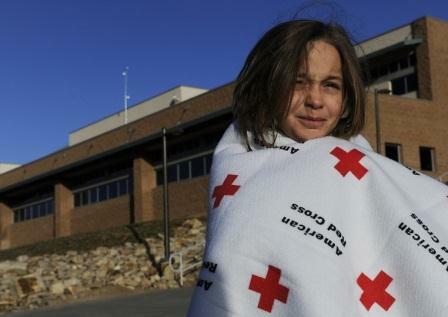 Samantha Schmidt, 9, spent the night at a Red Cross shelter for wildfire evacuees in Colorado. (Photo credit: RJ Sangosti / The Denver Post). 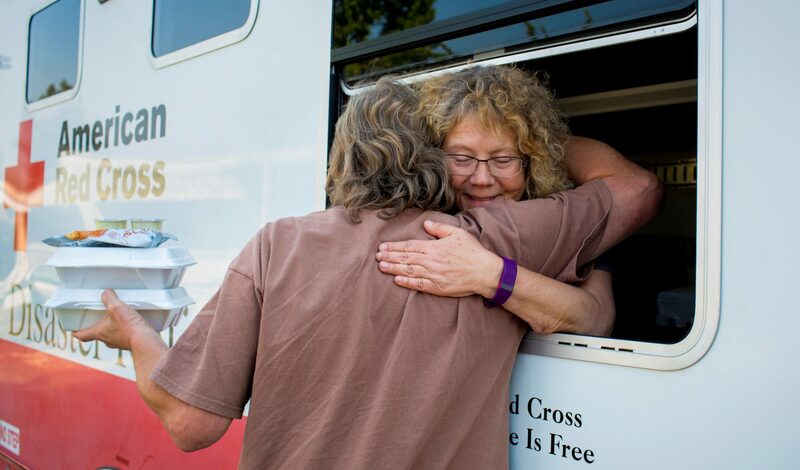 The American Red Cross is providing food and shelter in Colorado where a fast-moving wildfire has already forced hundreds of people from their homes with thousands more put on notice that they may also have to evacuate. The Red Cross encourages everyone who might be at risk or in a path of possible evacuation because of wildfires to prepare now. Use the recycle or re-­circulate mode on the air conditioner in your home or car. If you do not have air conditioning and it is too hot to stay inside with closed windows, seek shelter elsewhere. BEING PREPARED can be your best offense when it comes to wildfires. You should plan two ways out of your neighborhood in case one is blocked. Set up a place for family members to meet outside your neighborhood in case you can’t get home or need to evacuate. Arrange for temporary housing at a friend or relative’s home outside the area. Post emergency phone numbers by every phone in your home and in everyone’s cellphone. Identify and maintain an adequate water source outside your home, such as a small pond, cistern, well or swimming pool. More wildfire steps and tips are available. Check out The Denver Post for more on the ongoing wildfire and response in Colorado. You can text REDCROSS to 90999 to give $10 and support Red Cross disaster relief. Since the March 2 tornado hugged the ground, wiping out dozens of homes and businesses in West Liberty, Stacy, her husband, and their three children have sought refuge at the shelter where everybody knows everybody. “This is just like home,” says Daniel. 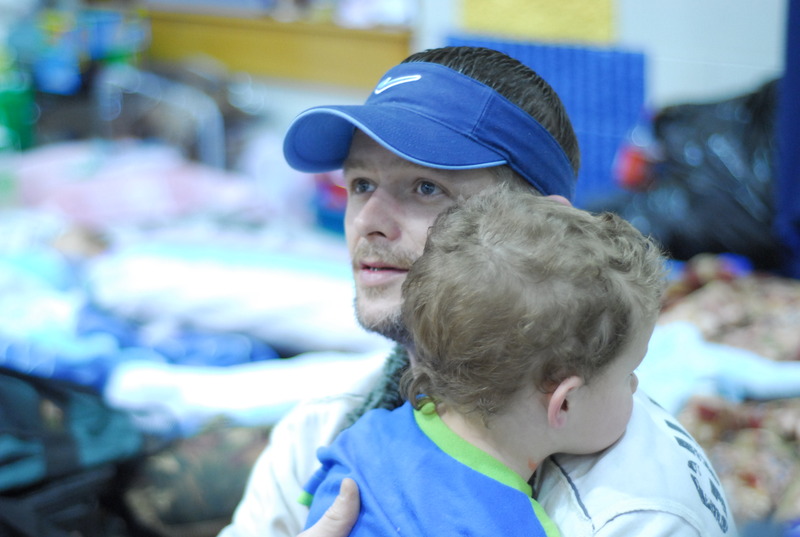 Disaster relief workers from around the region are providing essential services to more than 50 people seeking refuge in the shelter. The shelter is also an assistance station for dozens more staying with family and friends, but who are otherwise homeless. Shelter operations manager Brad Powell says Red Cross relief teams are also in the community. “We have relief workers doing damage assessment and mass feeding,” says Powell. Some of the relief workers at the shelter have had little sleep, including Breck Hensley, 16, who has friends affected by the tornado. 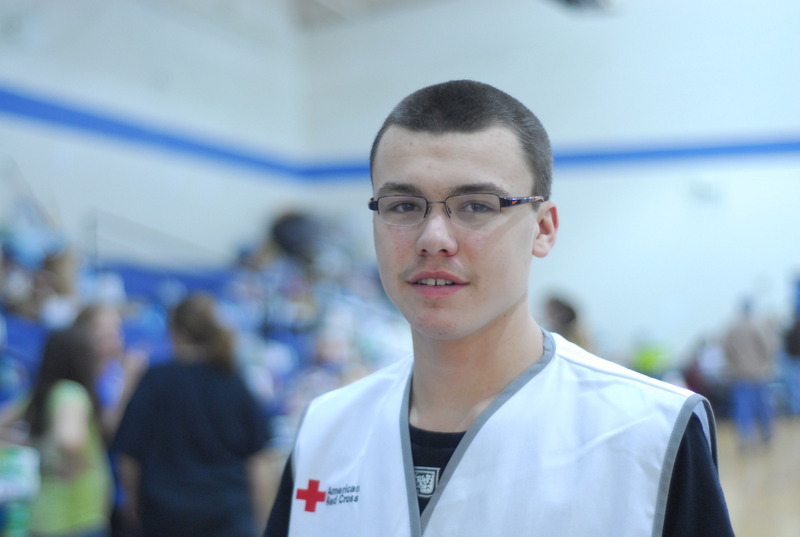 He says being a Red Cross volunteer is a good experience. “I’m just trying to help all those people who need it because if I were them, I would want it,” says Hensley. People in West Liberty are likely to rely on the Red Cross shelter for many more days as the slow process of tornado recovery takes its turn. officer of the Mille Lacs Band of Ojibwe Tribal Emergency Response Committee. 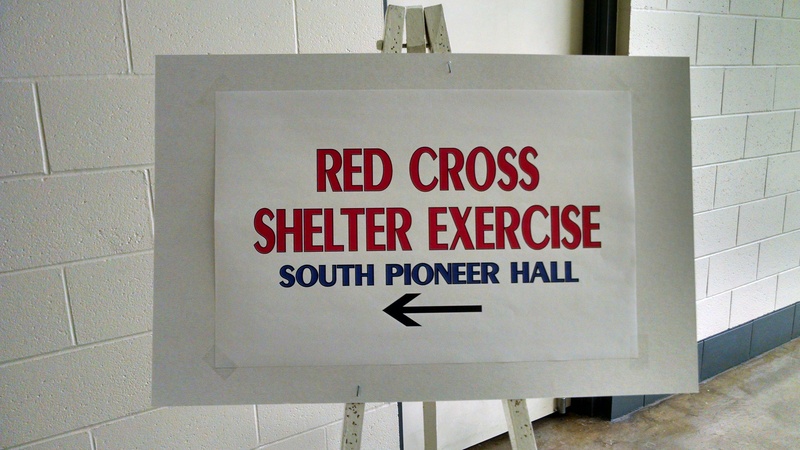 Red Cross officials were on the Mille Lacs Reservation on November 17  to train the Band’s Tribal Emergency Response Committee (TERC) on how to set up a temporary shelter. This training session helped TERC members understand the Band’s role and each of their roles in setting up an emergency shelter in partnership with the Red Cross. 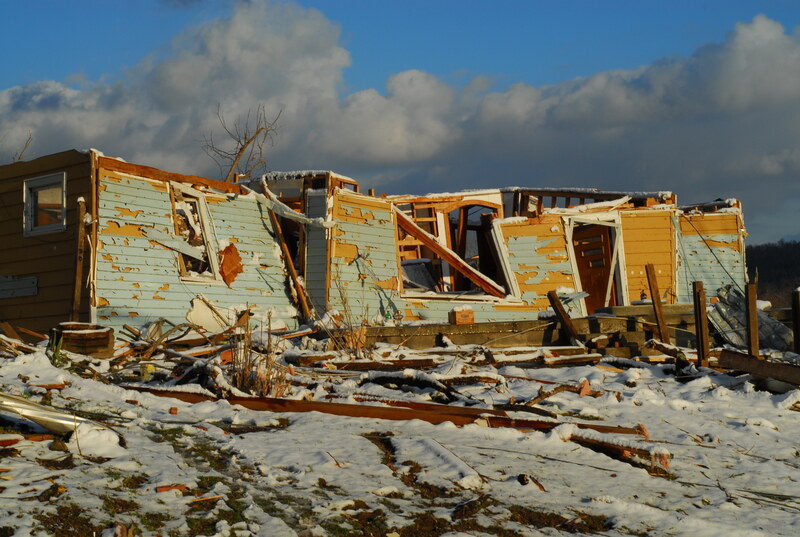 After the storm in District III this past summer, committee members requested training on how to set up temporary shelters at each District’s Community Center. If any future disasters should leave Band members temporarily homeless or without basic necessities, a shelter would be the most efficient way to respond. In general, the process would involve the Band preparing a shelter site (such as one of the community centers) for the Red Cross to bring cots, blankets and meals. 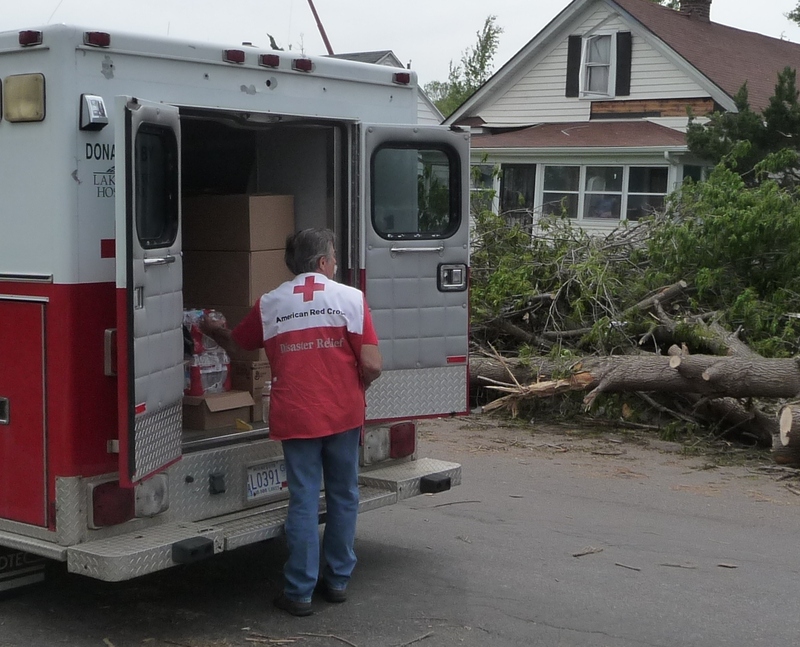 Since government entities do not normally keep these supplies in their inventories, the Duluth Red Cross [American Red Cross Northern Minnesota Region] would provide these resources under the direction of TERC. The Band would also be responsible for operating the shelter as well as services such as transportation, medical care, and mental health services. Click here to learn more about the Mille Lacs Band of Ojibwe. When a devastating EF-5 tornado slammed into Joplin, Missouri on May 22, 2011, St. John’s Mercy Regional Medical Center stood directly in its path. Over 180 patients – including some in operating rooms, intensive care, or the emergency room – were being treated. Dennis Manley, Director of Quality and Risk Management, returned to the hospital to help lead the evacuation of patients and staff that afternoon. “Because of the dirt and debris blown by 200 mile per hour winds, we had difficulty identifying some of the people we treated. One doctor, in fact, treated his assistant – but didn’t realize it until much later,” Manley says. The complete destruction of the hospital and surrounding buildings required evacuation of everyone in the facility. It took over 90 minutes, because virtually every window was shattered, corridors were blocked with debris, and doors were jammed. Fortunately, Manley observed, previous emergency drills had helped to prepare the hospital staff for many of the situations they faced that day. Advance preparation and close working partnerships with a wide variety of governmental and non-governmental organizations helped deal with the need for swift and effective emergency response. Attending the conference were (L-R) Glen Olson, Minnesota Department of Public Health, Carlos Garcia-Valez, Red Cross Northland Chapter volunteer and keynote speaker, Ruth Talford, Red Cross Readiness Manager, and Eric Nikolai, Red Cross St. Croix Valley Chapter volunteer. Building partnerships continued when more than 275 representatives from local, state and national government public health, human services, health care, and emergency response organizations, along with community volunteer emergency responders, shared updates, networked, and heard experts at the second annual “Emergency Sheltering: Under One Roof “ Conference. Participants came from five states and Canada. The American Red Cross Northern Minnesota Region and the Community Health Information Collaborative (CHIC) hosted the conference, which was held January 31-February 2 at the Black Bear Otter Creek Convention Center in Carlton, MN, and was funded by the Fred C. and Katherine B. Andersen Foundation in Bayport, MN. Janice Springer of St. Cloud, Red Cross Disaster Health Services Advisor for Minnesota, discussed meeting the access and functional needs of people in shelters. 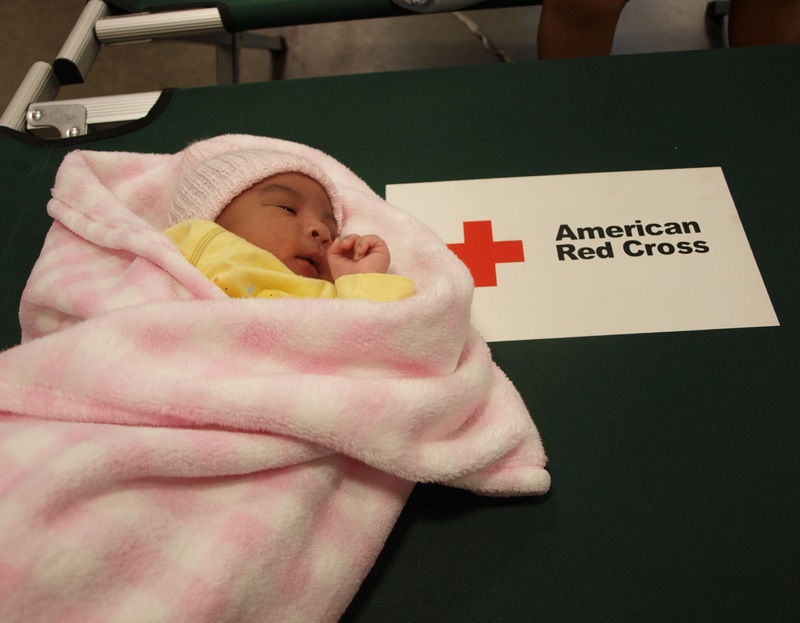 ”In 2011, the Red Cross opened 978 shelters in the U.S., serving more than 41,000 people with over 125,000 overnight stays,” says Springer. Red Cross volunteer Carlos Garcia-Velez was among those who responded to disasters last year. Garcia-Velez has served as an American Red Cross volunteer in multiple roles since 1992, including leading the Partner Services and Government Operations activities through many disaster relief operations. Most recently Garcia-Velez responded in North Carolina following Hurricane Irene. Garcia-Velez challenged the sheltering conference participants to work more closely together and collaborate on all levels.